Further, deficiency of thiamine can lead to the development of beriberi and/or Wernicke-Korsakoff syndrome. Symptoms of both include severe fatigue, and degeneration of cardiovascular, nervous, muscular, and gastrointestinal systems. Over-consumption of thiamin is unknown and studies show that amounts taken well in excess of the daily value (DV) can actually enhance brain functioning. Foods high in thiamin include pork, fish, seeds, nuts, beans, green peas, tofu, brown rice, squash, asparagus, and seafood. The current daily value (DV) for vitamin B1 is 1.2mg. Below is a list high thiamin foods sorted by a common serving size, use the nutrient ranking of all foods high in thiamin to sort by nutrient density (100-gram serving size). Looking for more foods high in B Vitamins? Click here for other vitamin B foods. -See all meats high in thiamin. See all fish high in thiamin. See all nuts and seeds high in thiamin. 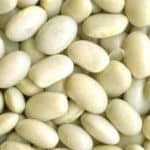 See all beans high in thiamin. See all vegetables high in thiamin. See all grains high in thiamin.